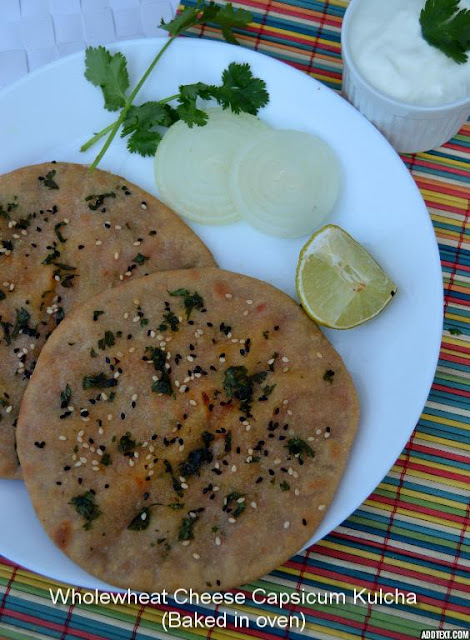 Kulcha is Indian flatbread that is made without yeast unlike Naan. Only baking powder, soda and curd are used as leavening agents in this. 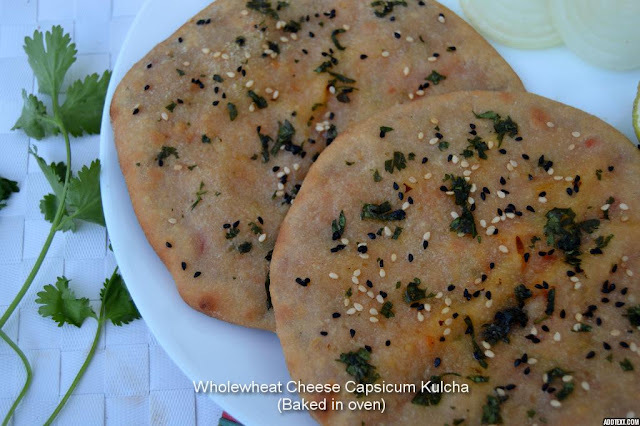 Cheese and capsicum are made for each other and this kulcha tastes just so yummy that you wont need any side dish for this. It is a typical punjabi recipe and generally eaten with chole. And mostly Maida / APF / Plain flour is used to make kulchas. For a healthier twist I tried making them with whole wheat flour and it turned out so well. 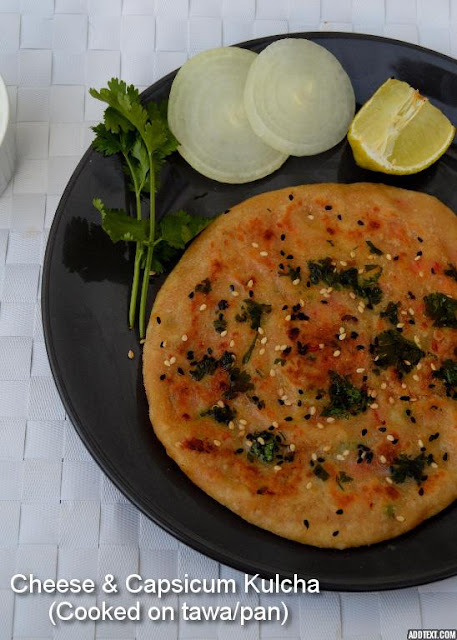 Traditionally kulchas are cooked in clay oven (tandoor) , but it can be easily prepared on tawa or baked in oven. I have shown both the versions here. Take the curd /yogurt in a bowl and sugar, baking powder and baking soda to it and mix well. In another mixing bowl, take the wholewheat flour and add requited salt, warm milk and oil. Rest the mixed curd for 5 - 10 minutes and it will start foaming as shown in third pic. Now add this foaming curd to the wheat flour and mix well to form a dough. Knead well and make into a smooth and pliable dough. Place it back in the bowl and cover it with a wet kitchen towel. (Make the towel wet in hot water). Meanwhile when the dough is resting, grrate cheese, and chop he capsicum into very fine pieces. Mix the capsicum with cheese and add chilli flakes, pepper, salt and red chilli powder. After 2 hours of resting, the dough would NOT have doubled in size as there is no yeast. Knead the dough back once and divide into 5 equal parts. Fold the edges and secure the filling. Pinch them together and make into a ball. Repeat with all the remaining balls and let them rest for 10 minutes covered with the same wet cloth. After 10 minutes, (pre heat the oven) and start rolling the dough slowly. With the palm slowly press them and make them into a circle. Then use a rolling pin and roll evenly into a 1/4 inch thick kulcha. Sprinkle the white sesame seeds, nigella seeds and some chopped coriander on the rolled dough. Then wet your hands and dab some water on the kulcha and also press the seeds so that they stick on the dough and dont fall apart. Place them on a greased baking tray and bake them in the preheated oven at 200 deg C for 6 - 7 minutes initially. So, in 6 - 7 minutes, the kulcha would have rised and puffed up. you can see in the first pic. Then brush some melted butter generously and bake again for 3 - 4 minutes until the top turns slightly brown. Grease the tawa with oil / ghee and when the tawa is very hot place the kulcha on it. On med - high heat cook the kulcha brushing it with some melted butter / ghee. You can see the kulcha rising and bubbles start forming. When the kulcha rises nicely and the bottom is cooked, flip it carefully and cook for a minute on the other side too. If you have a flame top, then reduce the flame to minimum and you can just invert the tawa on the flame to cook on the other side to get the tandoor oven effect.